Mailbag: What's cornerback Trae Waynes' future with the Vikings? Waynes is putting together a solid fourth NFL season, and perhaps the best number showcasing that is how often quarterbacks throw at him. Every Thursday morning, we’ll answer your Vikings questions submitted via Twitter and email for our weekly Access Vikings podcasts and post-game Overtime videos using the hashtag #AVOT. From @donraul007: Trae Waynes having another solid, if unspectacular, season. Do you think he gets a long-term deal, and if so what kinda numbers would they be looking at? AK: Waynes is putting together a solid fourth NFL season, and perhaps the best number showcasing that is how often quarterbacks throw at him. A year ago, Waynes was the league’s fifth-most targeted cornerback getting thrown at 102 times, according to Pro Football Focus. That’s nearly 6 ½ per game. Waynes has seen that drop by almost one-third. He’s been targeted 43 times in 10 games, or about 4.3 throws per game this season. He’s still allowing a 100-plus rating in coverage, per PFF, but he’s been a full-time contributor of a Vikings defense allowing the fewest passing touchdowns (14) so far. That said, it’s looking more likely the team keeps him for 2019 under a fifth-year option worth about $9 million. But his long-term future in Minnesota will depend on his asking price entering 2020, his age 28 season. Where does Waynes fit in the cornerback market? Bears cornerback Kyle Fuller, who signed a $14 million per season contract last spring, was coming off a season with 22 pass deflections that matches Waynes’ total from 2016 and 2017. Waynes doesn’t have the gaudy numbers or Pro Bowls, so his agent would have to sell a team on his potential to be a No. 1 corner to get that type of money. The Vikings have been successful at locking up homegrown talent on relative bargains for the team. That doesn’t happen with everybody, and it remains to be seen if it’ll happen with Waynes. From @purplebuckeye: Do the Vikings have an obvious matchup advantage against the Patriots? If so, what is it? AK: Tom Brady is the quickest thrower the Vikings will have faced since Drew Brees. That’s a big reason why Brady is among the league’s least-pressured quarterbacks (25.8%), trailing only Brees and Pittsburgh’s Ben Roethlisberger. Somehow creating pressure on Brady could be a key factor in derailing the Patriots offense. The defensive line is where the Vikings have an obvious matchup advantage over the Patriots, and Mike Zimmer’s blitz package could be a sleeping giant heading into Gillette Stadium. In the past three games against the Lions, Bears and Packers, the Vikings didn’t blitz much at all – including fewer than five blitzes each vs. Stafford and Rodgers. Perhaps that’ll change in New England. Heading into last weekend’s games, Tom Brady had the NFL’s worst passer rating (59.6) while blitzed, according to ESPN Stats & Information. 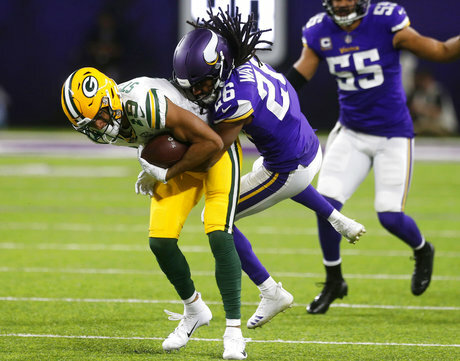 From Danny Carlson: Vikings have had a number of the missed-opportunity-that-could-have-won-it games (last minute drive against LAR, Green Bay field goal debacle, turnovers against New Orleans). Same was true vs. Chicago. Is this a very good team that’s had a few misfortunes or a mediocre team because good teams take advantage of these opportunities? AK: The Vikings’ misfortunes have primarily been turnovers. As our Ben Goessling pointed out a couple weeks ago, Mike Zimmer’s Vikings teams have routinely been in the NFL’s upper echelon at protecting the football. Even after a turnover-free game against the Packers, the Vikings still rank 21st in giveaways (16) this season. Not protecting the ball secured those losses against the Rams and Saints, and the Vikings are nothing more than a mediocre team unless they can stop turning it over. Quarterback Kirk Cousins took a step in the right direction last weekend. AK: The Vikings offense has used running back Latavius Murray as the closer in situations like Sunday’s fourth quarter, when Murray had six carries on the 7-minute drive that helped kill the Packers chances. Considering Dalvin Cook’s injury history, and Murray’s strength as a physical, downhill runner – it’s easy to see why their roles are such.